With OracleSupervisor you can monitor and tune your Oracle databases performances in the easiest way that has never been done for a DBA. 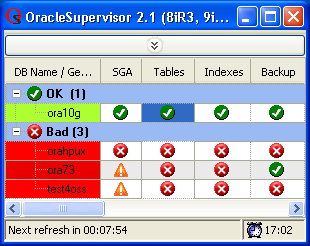 OracleSupervisor is a powerful agentless 64 bits application for tuning and monitoring Oracle databases from release 8iR4 to 12c. The main goal of OracleSupervisor is to inform DBA if databases are healthy. An healthy database is an online database with good performances (no wait, good ratios, objects statistics up to date, ...), backups performed, no jobs broken and many more. OracleSupervisor permit to find problems before they impact end users and improve the day life of every DBAs considerably. The Oracle databases are analyzed by OracleSupervisor at regular interval (defined in minutes), at a defined time (every Monday at 11:30 PM) or at every n days (every 2 days at 01:00 AM). OracleSupervisor automatically send, by E-mail, all database errors immediately as they occur. With OracleSupervisor you will have all your Oracle databases in the same view, and you can navigate instantly from one database to another one with only one click. DBA consultants who visit their clients can easily install it on sites and have a general overview of all databases. OracleSupervisor is developed in Microsoft .NET technology (C# language), which is the most powerful and reliable environment. Alerts are based on thresholds (can be updated). Here is the list of the Oracle components monitored. The Automatic queries are the components automatically analyzed by OracleSupervisor and the following list shows only the elements that are analyzed for alerting. The Manual queries are the components manually queried by the DBA with OracleSupervisor. No alerting is managed for these elements. Many SGA ratios (Library Cache, Dictionary Cache, Buffer Cache, Redo Log Buffer, Sort Buffer and PGA). List Shared Pool size advice, Buffer Cache size advice, PGA Aggregate size advice. Tablespaces Status, Tablespaces Used Space, Tablespaces Extent Management, Tablespaces Segment Space Management, Tablespace Logging, Datafiles Status, Datafiles Auto Extend. List Database growth, Tablespaces fragmentation. Tables Logging, Tables Chained/Migrated Rows, Tables Last Statistics Analyzed. List Tables with more than 5 indexes, Tables with no Primary Key (PK), Tables with disabled constraints. Indexes Status, Indexes Branch Level, Indexes Last Statistics Analyzed. List Foreign Keys (FK) that are missing indexes on the foreign key columns in the child table, Tables with no index. In this module, OracleSupervisor checks if the backups (RMAN and/or Operating System) have been performed in the last n days (an alert can be sent if no backup has been performed in the last two days, for instance). Last RMAN backup (checks the backup of Datafiles, Archives, Control Files and SPFile), Last Operating System backup (checks the backup of Datafiles only), Archive Mode activated, Archiver Process(es) running, Redo Log File group, Redo Log File members, Redo Log File Status, Redo Log File archived, Flashback Database activated (from 10g), Flashback Query activated. List all RMAN backups, all Redo Log Archives, all Redo Log switch frequency. Control Files Status, Number of copies of Control Files. List Undo and Roll Back Segments Status, Undo Segment Used Space. Broken Jobs, Number of Job's Failures, Job Next Time Execution Time Verification, Job Max Running Time. Scheduler Jobs Status, Number of Scheduler Job's Failures, Scheduler Jobs Max Running Time. Shared Servers Busy Rate, Dispatchers Busy Rate. CURSOR_SHARING, CURSOR_SPACE_FOR_TIME, LARGE_POOL_SIZE, OPTIMIZER_DYNAMIC_SAMPLING, OPTIMIZER_MODE, QUERY_REWRITE_ENABLED, SESSION_CACHED_CURSORS, SQL_TRACE, STATISTICS_LEVEL, UNDO_MANAGEMENT, WORKAREA_SIZE_POLICY, SGA TARGET (from 10g). Report Outstanding Alerts, ADDM Status, Last ADDM Analysis Tasks, Last AWR Snapshots. Report of the last ADDM Analysis Task. List Top SQL Statements ordered by Disk Reads or Elapsed Time, All locked Objects, Parse Calls by Session and at System level, How many Cursors are Cached and Opened, Table Scans Statistics (long/short), Wait Events by Session and at System Level, System Statistics. You don't need to install anything on the Oracle servers, you just have to install it on a MS Windows computer. OracleSupervisor is safe since only SELECT queries are sent to Oracle databases. OracleSupervisor keep all database's passwords crypted in file with a strong algorithm based on 128 bits keys. This guarantees a good security and a pleasant use of OracleSupervisor since there is no need to re-enter passwords every time OracleSupervisor is started. OracleSupervisor should be installed on a standalone dedicated computer. First release published (beta release for testing purpose only). Integration of Oracle 10g functionalities. © Copyright 2003-2016 OraIT - Cédric DELAVY. All Rights Reserved.